These are some photos of how Gata Luna looks today. I still need to paint the cockpit area but just about everything else on the boat is done (relatively speaking - a boat is never done). 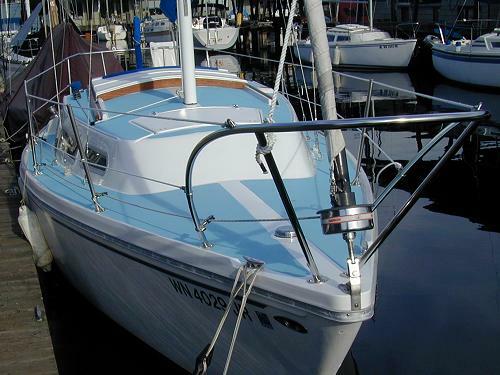 In this photo you can see the new bow pulpit, mushroom dorade, deck paint, lifelines (double), stanchions, and new bow cleats (with backing plates). 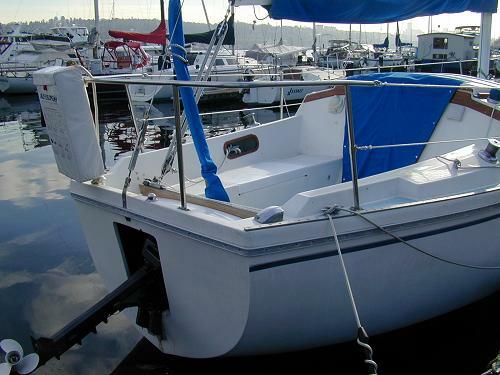 You can also see the painted mast and the new standing and running rigging. I replaced all the standing and running rigging. 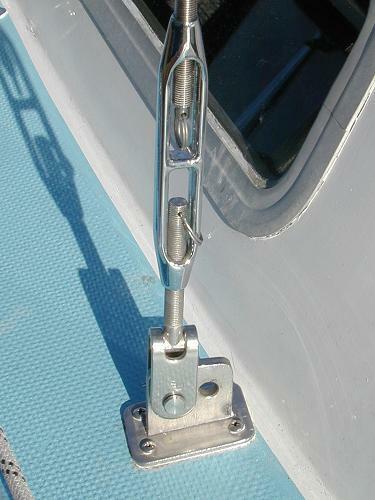 Here is a close up shot of the starboard upper shroud chainplate and the new open style turnbuckles from Hayn. Here is a shot of the mast with the new rigging, lights, spreader arms and brackets, and (unseen) VHF antenna, Windex, and anchor light. 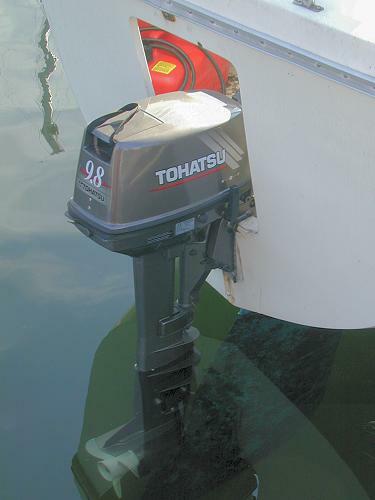 This shot shows my new Tohatsu 9.9 2-stroke motor with extended shaft (the only motor I could find to fit in the transom opening). You can also see the lifesling, new traveler system, adjustable backstay, and sunbrella hatch board cover. Here is a closer look at the motor in the down position. You can't see it in this photo but the rudder has a small notch in it so the motor won't hit it. This motor has been great. It's small, light, has electric start, an alternator (for charging the battery), and is very quiet. You would never know it's a two stroke. This photo of the dinette shows the new bulkheads, the new instrument panel, and the new cushions (ordered from Catalina). Here you see another view of the bulkheads, refinished teak, and the (yet to be refinished) galley. You can also see the chainplate backing plates on both sides. Yet another view of my beautiful bulkheads, the new cushions, the chainplate backing plates, and my fancy $10 Ikea ship's clock.